Graffiti is a form of art. Some people construe graffiti as vandalism instead of art, but that is just one way to use graffiti. It is illegal to draw graffiti on property that you personally do not own. If you like the look of graffiti, you can draw graffiti in your bedroom, on your own house, on a shed that you own, on sketchbooks, in your attic, in your basement or anything else you can think of that you personally own. If someone else owns the space with you, then you will need to get permission from her as well. Practice drawing graffiti letters in your sketchbook with a pencil. Practice designing and drawing several sample alphabets. 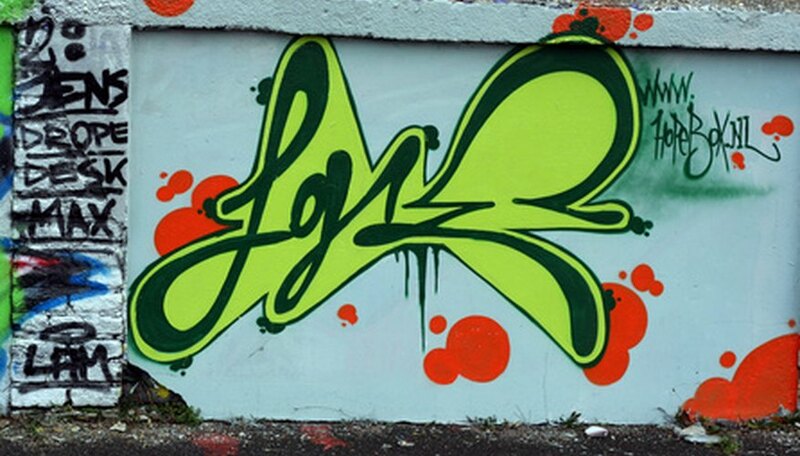 Keep in mind that graffiti letters overlap each other, can be large, blocks, bubbly, angular, rounded, all capital, all lowercase, cursive, print or any combination of the above. Practice drawing your sample letters in words with a pencil. When creating words, decide which of the elements from Step 1 you will include and how they will overlap. Also keep in mind stretching parts of a letter is a possibility, such as the bottom of an L, R, K or Z used as an underline for the rest of the word. Add creative elements to your letters, such as a face in the middle of an O, or teeth at the "mouth" of a G.
Choose your color scheme and then color the practiced words with markers. Outline your letters in one color and fill them in with another. Add drop shadows to your words with any color you choose. Choose a wall to paint on if you legally have permission to do so or own the space yourself. If this is not an option, you can use a canvas of any size you desire. Draw a grid using chalk. Then plot out your letters by drawing them lightly with the chalk. Paint the fill-in sections first with spray paint. Get closer to your words and then slowly use the spray paint to trace the outlines and draw the shadows. Apply varnish to your finished product to protect it. Make sure your space is ventilated properly when using spray paint. If you can, it is best to do this outdoors. If you are painting an inside wall, then make sure lots of windows are open and fans are blowing out the fumes.